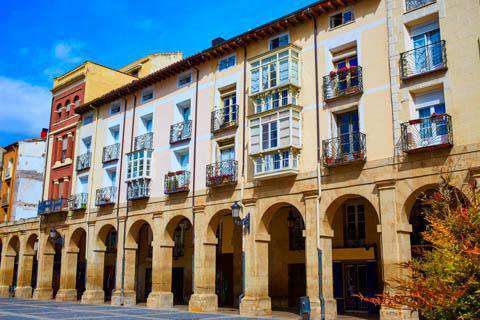 How much does it cost to travel to Logrono? How much money will you need in Logrono? €30 ($34) is the average daily price for traveling in Logrono. The average price of food for one day is €9.85 ($11). The average price of a hotel for a couple is €30 ($34). Additional pricing is in the table below. These average travel prices have been collected from other travelers to help you plan your own travel budget. How much money do I need for Logrono? Logrono, Spain is in the northern portion of Spain located on the Ebro River. It is the capital city of the La Rioja region. It is the center of trade for Rioja wine, which is primarily what the area is known for, and the city also produces wood, metal, and textile products. There are numerous churches to visit in the city with various architectural designs and styles, as well as many beautifully crafted stone bridges arching over the Ebro River. One church worth visiting is the Catedral de Santa Maria de la Redonda, which started out as a Gothic church before being turned into a full Cathedral in the 16th Century. Another popular sight that is well worth a stop is the Museo de la Rioja. The Museo de la Rioja is a museum located in the center of Logrono, and offers an extensive look into Riojan history. Centro Tematico del Vino Villa Lucia is another museum worth visiting if you're interested in wine. It is located just outside of Logrono and has an impressive collection including high quality wine from local producers. Museum visits are by guided tour only and include tasting. Though Logrono is the capital city of the La Rioja region, it is still relatively small for a major city, so it really isn't broken up into specific neighborhoods. There is the city center area, which contains most of the food, wine, and shopping options in the city. There is also an area referred to as Old Town, which is where many of the historical sights such as churches and other architectural structures can be found. The Rioja Trek is a great activity for wine lovers. It is located just outside of Logrono and offers a three hour wine experience. On this tour, you will get to visit a vineyard and bodega and actually get to participate in the process of making some wine, and you get to keep the bottle you make! The same company also offers wine tasting, family friendly related wine activities, as well as some trekking and hiking in the mountainous regions nearby. Logrono is also home to the regions Wine Harvest Festival. It is a big time of celebration in the region and everyone celebrates by coming together and throwing wine at each other (all in white shirts). Logrono is a city rich in history and tradition, and one of the biggest traditional things to do in this area include the pilgrimage of the Camino de Santiago, or the way of St. James, which includes a journey to Santiago de Compostela where the remains of St. James can be found. Logrono is one of the most important stops on many common routes to Santiago. One of the best reasons to visit this area, and Logrono specifically, is for the food. It has some of the best food in Spain and is well known for its pinchos, which is Northern Spain's take on tapas. You can find about 50 of these pinchos bars within a block radius, each of them offering a few specialties to avoid big competition and allow people a variety of choices. A few options worth a look are the Bar Lorenzo and La Aldea, which have great specialty dishes, but because each pinchos bar has their own style and selection, it's good to look around to see which one is more appealing to you (or better yet, try a few different ones and share with someone as this area is generally very reasonably priced. Logrono does have its own airport, but it is small and the cost is much higher than flying into one of the larger nearby airports. Bilbao airport is the closest reasonably sized airports, but Logrono is also accessible from Madrid airport. Logrono also has a recently renovated train system which is reachable from most destinations. The bus system is also very well connected to most major cities and so Logrono can be easily accessed from many places without a rental car. The city does have a decent bus system to reach most destinations within the city, but most of the major destinations are reachable within a 30 minute walk in the city area. In addition, if you're interested in biking, the city has a great system of bike lanes throughout the majority of the city.